The Demo : This is their second demo, Recorded & Produced by Steve Eyres. 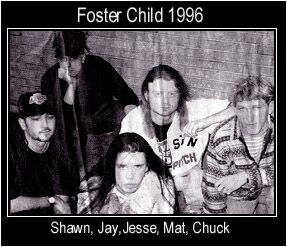 The original 3 thrash kids (Shawn,Jesse,Chuck) recruited Jay & Mat from the local cover band ‘Soul Kitchen’. Due to the lack of venues having original music, the band doubled as a cover band with originals thrown in to keep them playing every weekend. The band found themselves booked endlessly packing venues all over Ontario for the next 2 years including a few Cornstalks, KOA Bash’s, & a handfull of arena shows. The band did a summer tour of Ontario in support of this demo & heavy playing everywhere & anywhere lead to a good following. Although the plan was to gain more exposure by playing covers & getting into more clubs from this, they found covers were consuming all their time. by 1997, members started up original projects ‘Janet Theory’ & ‘Whatever’, while keeping Foster Child just a cover band once in a while until 1999 when their original projects took on life. 06 Two Friends & A Back Pack.mp3. 08 The Girl That Couldn’t Spell Her Name.mp3. Engineered by Steve Eyres at Eyres Studios, Chatham. Produced by Foster Child and Steve Eyres. Mastered at DB Studios, London, Ontario by Brian Burnes. Live at the Aberdeen in Chatham ’96. Click for video here. * Listen to ‘Heart’ By Foster Child.